The number “11” appears frequently in Jamaican history. When we look at Jamaica’s institutions of power and cultural pioneers, we find the number 11. It is considered to be a master number and as such is not simplified to its single digit which would be “2”. The number “11” possesses the same properties as the number”2″ as well as its own. “11” can also represent sin; transgression and peril. Ten being the perfect number, “11”represents the exceeding of both. It is interesting to note that eleven when broken down ( 1+1=2) comprises the “Two” of duality. Number eleven is a master vibration and as such should not be reduced to a single number. People with this number could be both idealistic and visionary, and they are attracted to the unknown.They can be both unusual, interesting and magnetic personalities. “11” brings the gift of spiritual inheritance, is gifted as the “Light-Bearer”. It is the number of the Light within all. Strengthened by the love of Peace, gentleness, sensitivity and insight. Greatest facility is the awareness of Universal relationship. Is related to the energy of Oppositions and the Balancing needed in order to achieve synthesis. Eleven is The PeaceMaker… Colours : Gold, Salmon, Prune, White and Black. *Jamaica’s Flag has two colors of number 11: Black and Gold. The number “11” possesses the qualities of intuition, patience, honesty, sensitivity, and spirituality, and is idealistic. Others turn to people who are ’11’ for teaching and inspiration, and are usually uplifted by the experience. The 11 is the most intuitive of all numbers. It represents illumination (Light Bearer); a channel to the subconscious; insight without rational thought; and sensitivity, nervous energy, shyness, and impracticability. It is a dreamer. The 11 has all the aspects of the 2, enhanced and charged with charisma, leadership, and inspiration. It is a number with inborn duality, which creates dynamism, inner conflict, and other catalysts with its mere presence. It is a number that, when not focused on some goal beyond itself, can be turned inward to create fears and phobias. The 11 walks the edge between greatness and self-destruction. Its potential for growth, stability, and personal power lies in its acceptance of intuitive understanding, and of spiritual truths. For the 11, such peace is not found so much in logic, but in faith. It is the psychic’s number. Football (Soccer) and Cricket, are all played with teams of 11 players on the field. The sun spot cycle repeats about every 11 years. Sun spots are dark spots on the surface of the sun. They occur more often during the active phase of the sun spot cycle. The spots have intense magnetic fields which are associated with magnetic storms on earth. Radio reception on earth is also affected by the sun spot cycle. 11 is the fourth number that stays the same when written upside down. The first three are 0, 1 and 8. There are three more between 11 and 100. Bustamante’s was born on February 24, 1884=2+24+1+8+8+4=47=4+7=11. Alexander Bustamante founded the Jamaican Labour Party or JLP in 1943. JLP= J=1 L=3 P=7=1+3+7=11. He passed away on Jamaica’s Independence Day on August 6, 1977. This gives us 8+6+1+9+7+7=38=3+8=11. Sir Donald Sangster Jamaica’s 2nd Prime Minister died while in office on April 11, 1967: 4+11+1+9+6+7=38=3+8=11. The same as his predecessor. Hugh Shearer Jamaica’s 3rd Prime Minister was born on May 18, 1923= 5+18+1+9+2+3=38=3+8=11. Bruce Golding Jamaica’s 8th Prime Minister was born on December 5, 1947=12+5+1+9+4+7+=38=3+8=11. Princess Alice, Countess of Athlone, (Alice Mary Victoria Augusta Pauline; née Princess Alice of Albany) The first Chancellor of the University of West Indies lived from February 25 1883 – January 3, 1981. February 25, 1883=2+25+1+8+8+3=47=4+7=11. Haile Selassie visited Jamaica on April 21, 1966: 4+21+1+9+6+6=47=4+7=11. Bob Marley Reggae Superstar, Founding Member of The Wailers died on May 11, 1981. 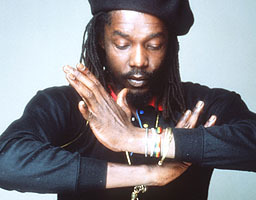 Peter Tosh Reggae Superstar, Founding Member of the Wailers lived from October 19, 1944 to September 11, 1987. Tosh’s date of birth on October 19, 1944=10+19+1+9+4+4=47=4+7=11. Tosh’s tragic death on September 11, 1987, which is the Ethiopian New Year occurred 14 years before the 911 attacks in 2001. Put differently if we were to add 14, another number prominent in Jamaican history to the date of Peter Tosh’s death, we would get September 11, 2001 or 911. The acronym of the Jamaican Labor Party, JLP equals 11. JLP= J=1 L=3 P=7=1+3+7=11. Prime Ministers Bustamante, Sangster, Shearer, and Golding have birth dates and or time of deaths which equal 11. The first Chancellor of UWI birthdate =11. Two popular sports in Jamaica are Football (Soccer) and Cricket, each requires 11 players. The date that Haile Selassie visited Jamaica equals 11. Bob Marley died on the 11th of May, 1981. The date of birth of Peter Tosh equals 11 and he died on the 11th day of September 1987. 14 years later on the same day America would experience the September 11, 2001 or 911 attack. ©VisionThought 2010. All Rights Reserved. This entry was posted on August 7, 2010 at 11:30 am and filed under 1962,Africa,African History, Africa,Afro-Centric,Alexander Bustamante,Ancient Egypt,Astrology,August 6,Black,Black History,Bob Marley,Caribbean,Conquering Lion of the Tribe of Judah,Conspiracy Theory,Esoteric,Haile Selassie,His Imperial Majesty Haile Selassie I,History, Politics, Numerology, Conspiracy Theory, Black History, Africa,,Independence Day,Jamaica,Jamaica Independence,Metaphysics,Music,Music History,Numerology,Occult,Pop Music,Popular Culture,Rastafari,Reggae,The Number 11,Uncategorized. You can follow any responses to this entry through the RSS feed.